The Foundation has repeatedly informed about various steps (including legal) undertaken by different state institutions (especially the State Language Inspectorate) to remove the Polish street name plates common in the areas inhabited by the Polish national minority in Lithuania. On January 28 this year, another disadvantageous decision for the Poles had been undertaken by the local authorities. 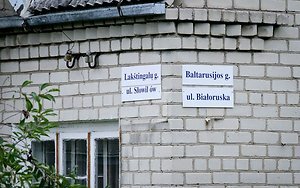 The representative of the Government for the Vilnius district demanded changes of the plates which do not conform with the law on the state language and the rules of naming, changing and registering the names of the streets, buildings, and other objects, in the whole area of the local government of Šalčininkai district. The Administrative Court of Vilnius obliged the administration of the local government to address the request of the applicant, namely to keep only the plates with the Lithuanian names. The Court College, after consideration of the administrative case, came to the conclusion that the director of the local government of Šalčininkai district unlawfully and unreasonably ignored the request of the Government representative concerning the change of double street names according to the legal acts of the Republic of Lithuania. Therefore, the Court by its judgement bound the local government of Šalčininkai to change the plates in order to meet the requirements imposed by the law on the state language within one month of the validation of its decision. The judgement covers streets in the following towns in the Šalčininkai region: Koleśniki, Dowgidańce, Purwiany, Montwiliszki, Ejszyszki, Dieveniškės, Jašiūnai, Żegaryń, Turgiele, Šalčininkai, Male Tetiańce, Biala Waka, Rudniki. The ruling is similar in tone to the ruling of the Supreme Administrative Court of July 8, 2011 regarding the local government of the Vilnius Region. The judgment was sustained by the Court of Appeal and further validated. However, the question regarding the addressee of the judgement as well as the persons obliged to execute it, should be further addressed and clarified, due to the past incidents with bailiffs disturbing private property owners, and even threatening them with criminal penalties. Due to the possibility of similar events happening in the future, the Foundation decided to spread among the inhabitants of the aforementioned towns, a leaflet which aims to instruct the building owners with bilingual plates on their rights in this situation. In accordance with Art. 642 of the Code of Civil Procedure, the court decision should be made by those who are indicated in the execution title, that is, those covered by the judgement. In this case, according to the Foundation, the addressee of the judgement of the Administrative Court of Vilnius of January 27, 2013, on illegally posted bilingual topographical names in the towns of the Vilnius region, is only the local government administration of Šalčininkai district. This means that the owners of the buildings, on which there are bilingual signs, are not participants to the proceedings and any responsibility cannot be imposed on them. Any interpretation of the judgement stating that it should apply to those building owners would mean that it also covers all similar situations and is addressed to an unlimited group of people (is abstract in nature and universal), and this would undermine the rule of law and would be contrary to applicable to Lithuania Article 6 of the Convention for the Protection of Human Rights and Fundamental Freedoms guaranteeing the right to a fair trial. Moreover, it would be contrary to Article 97 of the Code of Administrative Procedure, according to which a decision which entered into force is to be executed by the entity whose act or omission was challenged. In such situation, the Foundation believes that an administrative decision considered by the Court, concerns only the areas (houses, buildings, etc.) subordinate to the local government, and does not apply to the private properties. If anyone receives a letter from the authorities or the court regarding this matter, please contact the Foundation urgently. It is important not to exceed the time limits within which it is possible to file an appeal or challenge the decision. The Foundation provides free legal assistance, including representation before the national as well as international courts. For more information, including the leaflet, in which it is included how to act in this situation, can be found at www.efhr.eu.